Butterflies DVD box set. 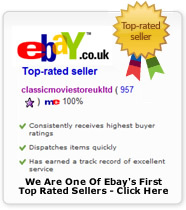 The complete 4 series on 5 dvd's. DELIVERED FREE IN THE UK when you spend over £15. Wendy Craig stars as Ria, a suburban housewife frustrated with the routine and dull family life, and longs for some escape from the routine. She has never mastered the domestic arts and her well-meant efforts in the kitchen end up in spectacular disaster. Husband Ben and lazy sons Russell and Adam live in fear of mealtimes as non-recognizable creations need coaxing from the pan and the words egg custard stir panic. Desperate for some excitement in her life, could a chance meeting with the charming and wealthy Leonard be the answer she is looking for? 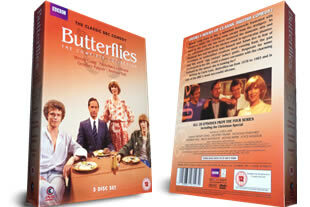 Written by Carla Lane, Butterflies ran from 1978 to 1983 and is one of the BBC's most successful sitcoms. This Box set features all 4 series - 28 episodes on 5 discs (including the Christmas Special).